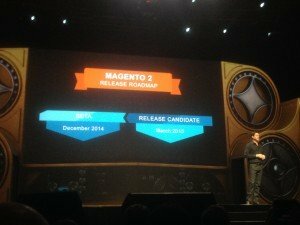 > Magento 2 – it’s coming! Magento 2 – it’s coming! Posted: Wednesday 14th May 2014 in eCommerce Technology, News, Thought Leadership. News on the most anticipated Magento platform upgrade, Magento 2, was revealed today at the Imagine conference in Las Vegas. Here’s what we found out. Easier to deploy, maintain and scale. They’ve modernised the tech stack with improved support for HTML5, CSS3 and JQuery. One of the great success factors of Magento is the ability to extend the functionality of a site through the addition of approved extensions from the Magento Connect marketplace. The code base for Magento 2 has been restructured to make this plug-in process easier so that the core site performance isn’t impacted. The code base is more modular so making changes to the code base is easier. They’ve separated business logic from site presentation. Another major change with the release of 2, will be the way in which Magento roll out new releases of the platform. At the moment we see significant upgrades released on an annual basis. The architecture of version 2 will allow for a more agile release process with multiple incremental updates being released at shorter intervals. This new approach to the release cycle will introduce new features for retailers more regularly ensuring that Magento can deliver innovation to merchants much faster. An initial BETA release will be made available in December this year for Solution Partners, such as Summit, to start familiarising ourselves with and learning about the new infrastructure. Magento are looking for our feedback and our insights from this BETA release prior to the full release of the platform being made available from March 2015. And this isn’t all we’ve learned today. Hot off the press, version 1.14 of the Enterprise edition and version 1.9 of the Community edition have been made available for download today. This release is all about responsive design, new check out features and improved search indexing functionality. The leading feature of the release is definitely the new responsive templates. To achieve this they’ve had to essentially re-architect the Magento front end and reduced the number of Enterprise templates by 53%. Magento claim that this new front-end structure will provide significant time savings for the build and deployment phases – savings that can be passed onto the retailer. It also means that every new site built on Magento 1.14 will be fully responsive across desktop, mobile and tablet. The new check out features were all about PayPal. PayPal Express check out is now a standard feature of the platform with their checkout featuring one less step to complete a purchase than most other check out processes. They’ve also integrated with PayPal’s BillMeLater. This feature allows customers to purchase an item and then stagger their payments for it over a set number of months. The merchant receives the full payment at the point of purchase, so the risk is reduced and cash flow isn’t impacted. Magento claim that merchants who have implemented BillMeLater have seen an average of 18% uplift in sales. Lastly, site performance continues to be improved with the Solr search indexing now built to run as a background process. We’ve been inspired today by these announcements and the vision that ebay and Magento have built for the platform. It continues to gain ground around the world with 2013 seeing another 240,000 merchants (60% more than 2012) start trading on the platform. More than $26 billion in merchant transactions are now managed annually through the platform. Magento’s combination of continuous innovation, an experienced partner network and an excellent total cost of ownership makes it a sound business decision for many merchants. We’ll continue to share updates on the release of new Magento versions and keep reviewing the latest code made available to us through the Magento Github and Wiki resources. We’re Magento Gold partners and have been building beautiful and high performing eCommerce platforms since 2006 using our enhanced version of the Magento Enterprise 1.13 platform. If you’d like to know more about how we can help you get more from Magento please contact Chris Dickson on 0203 428 5300.